They face people who violate the law or traffic rules every day. The staff of the Kyiv Patrol Police Administrative Services Hall is undergoing Communication Soft Skill Training organised by European Union Advisory Mission (EUAM) Ukraine. How to communicate with a visitor in friendly manner, how to overcome a conflict situation, how to deliver citizen-oriented service and how to become resistant to stress? These are the main topics of the training. “The communication soft skills training is provided for all staff of the Administrative Services Hall. To make sure that the training has worked, we will evaluate it with the feedback forms of the participants. Also we will question citizens who receive services at the Administrative Hall on its improvement”, highlighted Laidi Surva, the acting Head of EUAM Good Governance Advisory Unit. 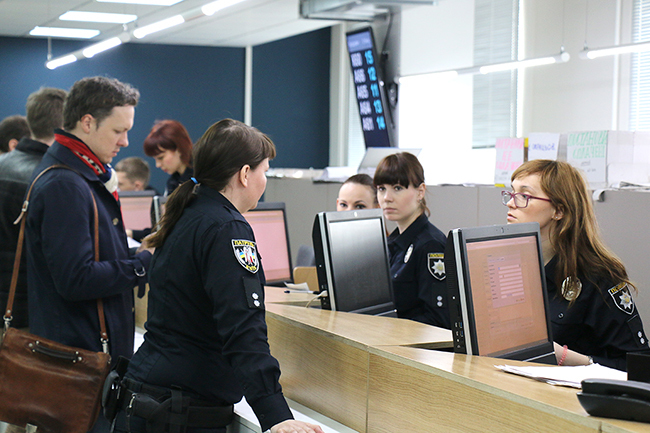 “It is very important to build and to balance communications with the clients of the Administrative Services Hall”, underlined Dmytro Evdokimov, the Deputy Head of Kyiv Patrol Police. “We started our cooperation with EUAM a long time ago. The Mission provides us with invaluable help. We get strong support in communications and strategies of work in particular”. The training will be provided for 35 officers of the Administrative Services Hall. All of the five courses will be delivered by the middle of May.